The first son of former special adviser to former President Jonathan Ditan Okupe just indicated interest in joining President Buhari’s Campaign Team. 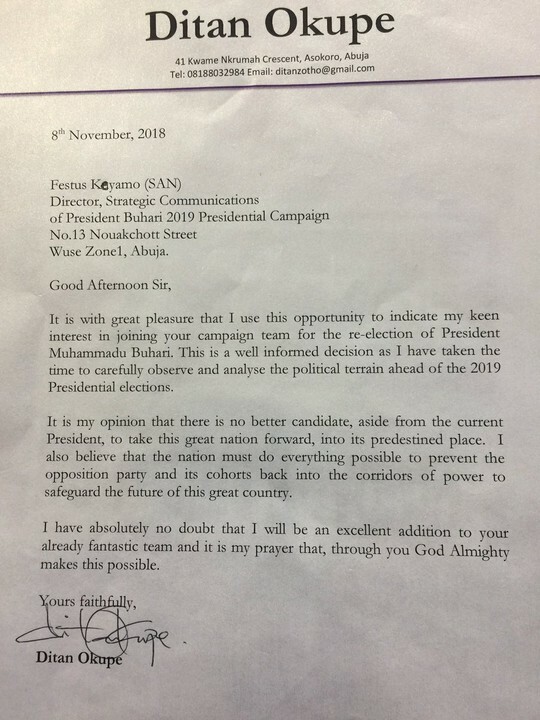 In a letter he wrote to Festus Keyamo, Director General of Buhari’s Campaign Team, he expressed willingness to be a part of his team. 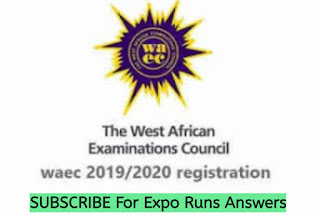 Ditan Okupe is a UK trained Lawyer and has 12 years post-call in Nigeria and the first son of Doyin Okupe who is one of the front liners for Atiku’s emergence as Nigeria’s President. Doyin Okupe who once said but later denounced the publication made it public that if Atiku should win the Presidency, and rule for a day, it will take Nigeria 10 years to recover. When the news of Ditan Okupe got to his father, he replied; “Ditan Okupe is my Son. He is a very brilliant young man. He went to Kings college, Lagos, Burkinham university, UK and did post graduate studies in Law at the London School of Economics.We both have had serious issues in the last 5yrs.This may be his way of getting back at me. I wish him luck. Keyamo is my friend and lawyer.He is still handing a case for me at the Supreme Court.He called me tonight on his acquaintance with Ditan who also has been trying for months to get the contacts of people he considers my political foes,includinng Tinubu, Kashamu,Otunba Gbenga Daniel etc. Lauretta Onochie, a social media aide to President Buhari praised Festus Keyamo. She tweeted; “Good job Keyamo. It is fantastic to see the younger generation of iconic corrupt moguls, embracing the anti corruption team. There’s a great future for Nigeria. Recently also, the son of former President Olusegun Obasanjo pledged his support to Buhari’s re-election bid while his father is backing his Vice, Atiku Abubakar. Are the children of these great men moving in the right way considering the fact that their parents contributed to the mess Nigeria is in now? 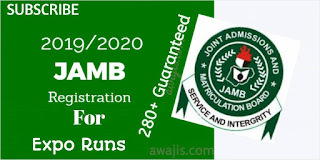 Do they think President Buhari has what it takes to move this country forward? Do they have the political clout to counter balance that of their fathers’? Are they trying to get back at their fathers? 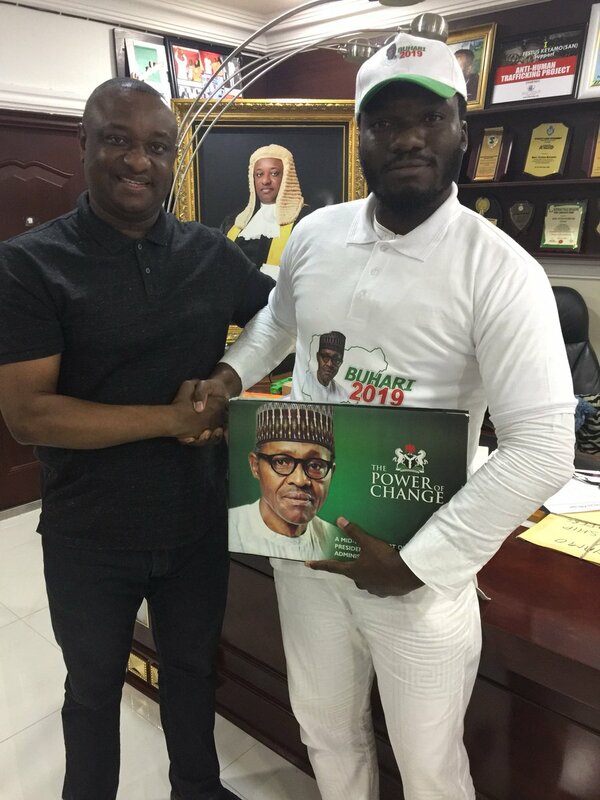 0 Response to "Doyin Okupe’s First Son Joins Buhari’s Campaign Team (Photo)"